Jan DeBlieu _ What does it mean to serve others selflessly? As I began learning about selfless service, I was surprised to discover that the effectiveness of any kind gesture or helping program depends heavily on the personal qualities you bring to it. At first I hoped to find quick solutions to problems, whether they were caused by temporary disruptions or chronic social ills. I wanted to figure out which kinds of programs work and which don’t, period. But that’s not the way true service unfolds. 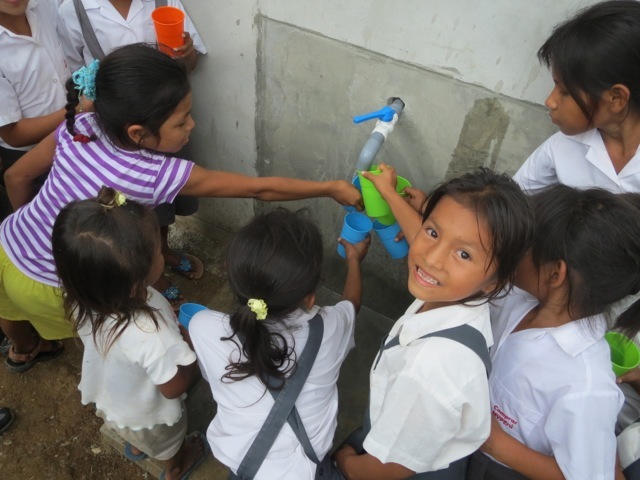 Among the things I've seen in the service projects I've visited, this is one of my favorites: children in the Peruvian Amazon taking their first sips ever of clean, filtered water. The project was run by the nonprofit group CONAPAC. Gradually I saw that there’s an art to helping others. To reach the best solutions—the ones with lasting results—I must abandon my own thoughts about what's needed and go into the act of service willing to embrace whatever ideas present themselves. Often these come in unexpected, even startling, forms. But when they address what people most need, their results can be beautiful. And when helping efforts are carried out with utmost selflessness, they reach a level of very high spiritual practice signified by the Sanskrit word Seva. An important first step toward reaching Seva, I've found, is simply staying open to others’ suggestions (instead of giving in to my always-present thought: I know what to do!). This takes a great deal of practice. Here are a few things that have helped me succeed, at times. It’s always a struggle. · Quiet My Mind – When I began learning about service, I read about the need for this over and over. I wasn’t even sure what it meant. Simply put, it’s shutting off the torrent of thoughts that plagues me almost every moment. There are many ways to make the mind fall silent, perhaps the most common being meditation. Personally, I have difficulty with traditional forms of seated meditation. I simply fall asleep. But I’ve found several other forms that I love, including a moving meditation that’s described in a blog post here. I began to succeed at meditation when I stopped worrying about whether I was doing it right and started concentrating on what works for me. · Step Out of Time – I try to just quit worrying about where I need to be in an hour, or three. When I’m in a hurry, especially then, I try to act kindly, smiling at people or letting other drivers cut in front of me. Quite to my amazement, I’ve found that slowing myself down, noticing the people around me, and behaving as if I have all the time in world helps me accomplish more. Go figure. It’s certainly a kinder, healthier way to live. · Open Myself to Others – At times I find myself closing down when confronted with a person who needs something I can give, or who just pushes me out of my comfort zone. If I catch myself doing this, I try to breathe out hard and push down the invisible wall I’ve erected between me and the other person. This simple exercise is remarkably effective. · Work Shoulder to Shoulder with Those in Need – The most lasting solutions come when I treat the people who need help as equal partners. They’re really very smart—and when we work together, we come away appreciating each other. · Give Only What’s Needed – I try to empower people to solve their own problems, and then quietly step away. · Cultivate Humility – What’s involved in these efforts, when they’re done carefully and well, is much bigger than me. These are among the steps I try to take in my service to others. Practicing them soothes my grief and helps light come back into my life. I can’t tell you exactly how this happens. It's really a bit miraculous. And it’s led me to a single conclusion: Above all, selfless service is a spiritual practice.